Anyone with a network, business or home, should have a firewall. A firewall is a device which is plugged in between your network and the internet and works to protect your you from malicious viruses and people who attempt to gain access to your network. To be clear, this is NOT the device that your internet provider provides you which is often called a modem and is where the internet line actually comes into from the world to your business. This is an additional device that you should add to your network for your protection. Firewalls have been around for a long time and most businesses have installed one at some point because someone told them they should even if they didn’t know exactly why. That’s a start. But the “old school” firewalls which simply decided if traffic should or should not pass through are not enough anymore. This is the case because we will absolutely let email and web traffic pass through, but malicious code and viruses can tag along on that valid traffic to try to get into your network. Based upon this, security providers created what is called a “next generation firewall” (NGFW). 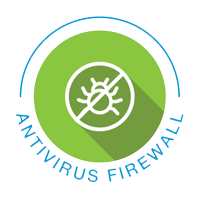 A next generation fire wall not only restricts traffic the old school way (called stateful inspection), but has added a layer of software subscription protection which constantly learns about new viruses and attacks being created in the world on a real time basis. As you access different sites on the internet and data passes through your NGFW, it will look at its database of known bad traffic collected from all of the devices it has on the internet to help make sure that malicious code can not get through to your network. Unfortunately nothing is fool proof , as when something new is created the databases don’t know about it yet and it will get through to someone’s network once. This is much better than millions of networks and the likelihood of you being first is somewhat low. Next generation firewalls are made by companies such as Cisco, Palo Alto Networks and Checkpoint. While there are annual subscription fees to use the virus databases, the costs are much lower than having your network down from an attack or losing your company’s proprietary data. ← What is ransomware and do I need to be concerned about it? For the non-tech savy (of which I am sometimes guilty), this is important information as the bottom line of running a business can also impact decisions made in this arena. Importantly, you Michael have always had our back in this area and provided sound guidance with a balanced approach to also keep budgeting in mind. This info is great and very understandable even for a legal pad guy like me. I am really enjoying your posts as they deliver common sense useful knowledge. Next up Next-Gen Antivirus and it’s sooooo overdue! Sounds like an evolving knowledge base of known threats that is maintained by vendors that sell subscriptions. I’m not sure how business would operate without this protection.